Memos aren’t only accessible from their location next to documents, codes, document segments, etc. They are also available as an Overview of Memos. You can access these overviews in various ways. The “Document System” allows you to compile all the memos in a document, in a document group or document set. To do this, select the entry Overview Memos in a context menu accessed by right-clicking the document, group or set. In the context menu of a code you find the entry Linked memos, with which you get a list of all memos linked to the clicked code. No matter which point you open the Overview of Memos, a list of the corresponding memos appears. Each memo represents a line in this table. Double-clicking on a line opens the respective memo. The name of the document and document group in which the memo is found (or the name of the code in the case of a code memo). For memos attached to document segments, the paragraph number of that segment is listed. The author of the memo. The origin of the memo (e.g. the document, document group, document segment, or code the memo is attached to). The upper section of the window displays the memo text, so that various memos can be scrolled though without opening individual memo windows for each. Memos cannot be modified or deleted in the “Overview of memos”. Instead, right-click on the line where the memo is listed and select Delete Memo. Please note: To modify a memo, double-click on the line where it is located. The usual memo window will open, and from here you can modify or add to the memo text. The overview can be adapted like all MAXQDA tables: The columns can be changed with the mouse in their width and position, and by right-clicking on a column header. A click on the header sorts the column in ascending order, another click in descending order. As with all overviews in MAXQDA, the tabular Overview of Memos can be sorted according to diverse criteria. This is especially handy if you want to compile only the code memos of a project or user, or only the memos that were created after a certain date. Click on a column header with the right mouse button and select Set filter to set a filter for the selected column. For more information on filtering overviews, see Filtering Table Overviews. 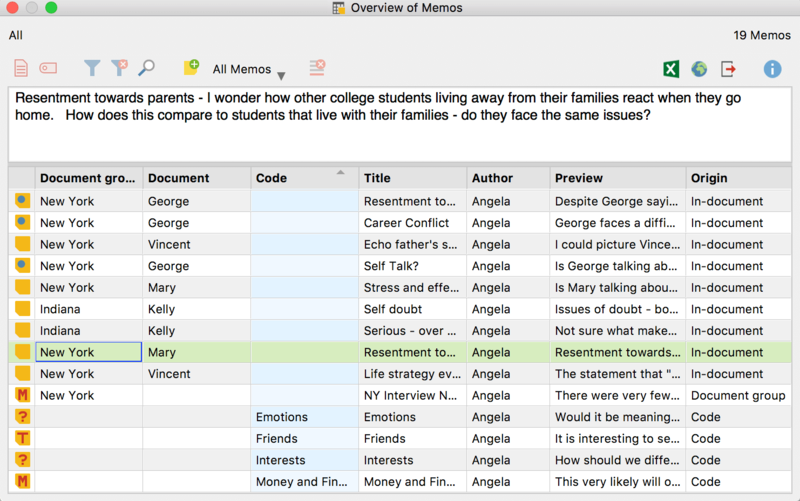 All Memos – Filtering is switched off, all memos in the table are displayed. Memos of selected users – Allows you to choose users or select only memos of certain users. Code Memos – Reduces the display of the current table to the memos assigned in the “Code System”. In-document Memos – Reduces the display in the current table to memos that have been assigned to a document. Document Memos – Reduces the display of the current table to the memos assigned to the “Document System”. Free Memos – Reduces the display of the current table to free memos. Memos associated with an enabled code – Reduces the current table’s display to the memos associated with a currently enabled code. Memos in audio and video files – Reduces the display of the current table to the memos assigned to an audio or video file in the “Multimedia browser”. The predefined filters work independently of the filter options described for the table view above. It is also possible to search in the various columns. To search in a specific column, right-click on the column header and select Search. The instances where the search term appears are immediately highlighted, and the up and down arrows allow you to navigate between memos. To search multiple columns simultaneously, select the Choose search columns option. When you use the magnifying glass symbol in the Overview of Memos toolbar, the search will automatically be carried out in all columns. Please note: When you search the “Preview” column, only the only the first 63 characters of the memo will be included in the search. If you want to search the entire memo text, select the option Analysis > Lexical search. Free Memos are visible in the Overview of Memos only when all memos from the project are included. From each memo displayed in MAXQDA’s Overview of Memos, the source document immediately appears in the “Document Browser” positioned exactly at the place where the memo is found. For code memos, the code in question is selected in the “Code System” (highlighted in blue). For document memos, the document in question is highlighted blue in the “Document System”. When using memos from an audio or video file, the playback is positioned at the corresponding location of the memo, but only if the Multimedia Browser is visible.